At 41 inches tall, this is an ideal gate for large pets or pets that like to jump. For convenience, a little door on the bottom opens to allow small pets, such as cats or little dogs to pass through the gate while keeping larger pets where you want them. With a 6-inch extension kit, this gate is able to fit openings between 29 and 40 inches wide, in increments. The sturdy gate is ideal for doorways and hall openings, and when used with the four included wall cups, it can be installed at the top of stairs. 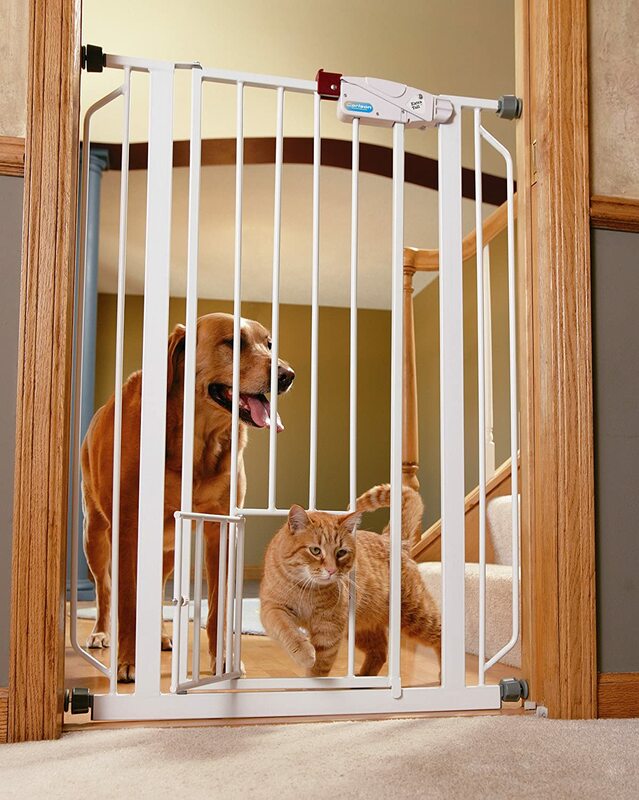 An essential tool for homes with pets, the Carlson Extra-Tall Walk-Through Pet Gate is a convenient, chew-proof way to contain and protect both your pet and home. Made of steel, the 41-inch-tall gate is designed with a pressure-mount system for easy installation and is ideal for extra-wide openings. The #0941PW expands from 29”- 40” and that includes only one 6” extension.. The walk-through design features a one-touch release handle so you can easily pass even while carrying things. A 10-by-7-inch pet door lets small animals pass through while everyone else stays put. The lever-style handle features a one-touch release safety lock for easy adult operation.